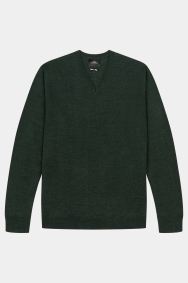 This forest green jumper from Moss London is the go-to choice when the temperature drops. Made in Italy for guaranteed comfort and quality, the plain style makes it versatile enough for work or play, while its 50% merino wool construction will keep out the cold with ease. 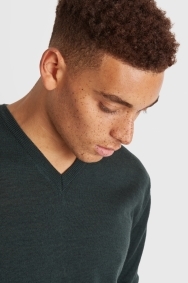 With its on-trend V-neck, it’ll be a great layer over skinny fit shirts. 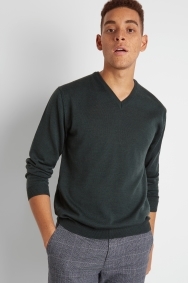 The jumper’s green tones will go well with grey or navy trousers. For a look with character, wear it over a printed shirt and dark jeans. Keep that top button undone for a cool, smart-casual look. A nice fabric with a good feel, very comfortable to wear.